His words alone — “man,” “primitive,” “oriental”— signify how much has changed over 36 years in thinking about objects from the cultures and peoples of places like Colombia, Peru, the Pacific Islands and Nigeria. Now, as part of its ambitious master plan, the Met is announcing a $70 million renovation of the Michael C. Rockefeller Wing, which will be designed by the architect Kulapat Yantrasast of the firm wHY, to begin in late 2020 and be completed in 2023. The project will reintroduce the collection’s three distinct geographic regions in the context of “the global canon of art history,” said Max Hollein, who is 100 days into his tenure as the new director. n his first joint interview with Daniel H. Weiss, the museum’s president and chief executive, Mr. Hollein also offered a window into how he will approach the Modern and contemporary art program as the museum moves forward with long-awaited plans to remodel its Southwest Wing. The Met has long needed proper galleries in which to display its storied collection of 20th and 21st century works, including Leonard A. Lauder’s trove of Cubist paintings, drawings and sculptures, one of the most significant gifts in the Met’s history. Work on the wing was delayed in 2017 so that the museum could address a looming deficit. Now that Mr. Hollein has arrived and the museum’s finances have stabilized, the Met has reactivated the project, albeit in a scaled-back form, aided by its decision in September to concentrate on the Fifth Avenue building and turn over the Met Breuer to the Frick Collection as of 2020. Some have questioned the Met’s efforts to improve its Modern and contemporary program, given that New York already has the Museum of Modern Art, the Whitney Museum of American Art and the Guggenheim. Mr. Hollein said he will not attempt to compete with these institutions, but instead will try to make a distinctive contribution to the discussion. While the new wing will juxtapose works from after 1900 with the museum’s historic holdings, as the Breuer has, Mr. Hollein said the museum will also broaden the definition of what constitutes Modern and contemporary art, taking a global perspective from 1880 onwards. The Met has been expanding its collection with global acquisitions from India, Egypt, Brazil, Mexico and more, according to a spokesman. One recent acquisition is a piece purchased at auction two weeks ago by the postwar Egyptian artist Abdel Hadi El-Gazzar. Mr. Weiss said the Southwest Wing, with a revised design by David Chipperfield, was projected to cost $600 million, compared with an estimated final price tag of $800 million for the previous plan. Fund-raising is advancing “to the next level,” Mr. Weiss said, though he would not be more specific on timing or a possible lead gift. This and other Met building projects, Mr. Weiss said, can move forward now that the museum is on track to balance its $320 million annual budget by 2020. The Met has increased its revenue 41 percent over last year, he explained, largely as a result of the museum’s new admissions policy — which went into effect last March — requiring non-New Yorkers to each pay $25. Also important was waiting for Mr. Hollein to arrive and to take his vision into account. “It has to be his project,” Mr. Weiss said. The Rockefeller Wing, a 40,000-square-foot gallery on the museum’s south side, has been hampered by condensation on the glass and excessive light. 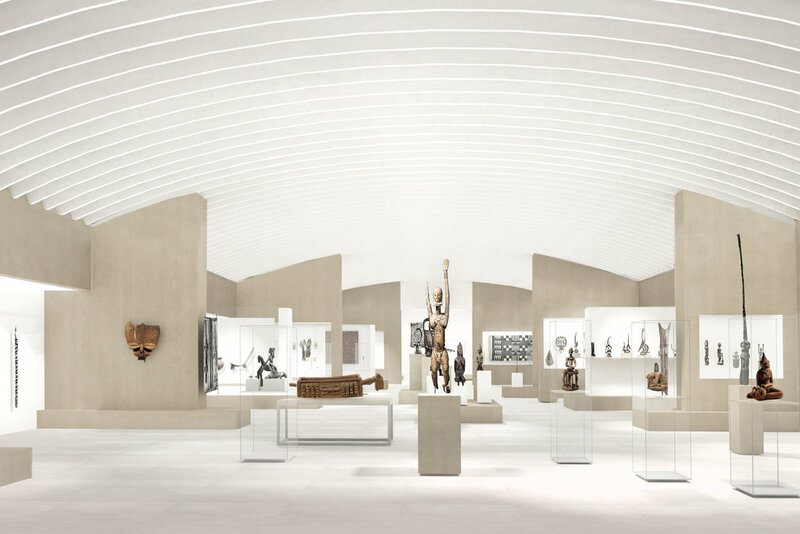 In addition to addressing these problems, the renovation provides the museum with an opportunity to tell discrete stories about each region (Africa, Americas, Oceania) rather than have the sections run into one another. Mr. Weiss said about one-third of the funds for this wing have been raised so far, mostly from trustees. In rethinking the Rockefeller Wing, for example, the Met will explore the relationship of Egypt and Rome to Africa as well as the relationship linking Europe, North Africa and sub-Saharan Africa. Already underway is the Met’s $22 million refurbishing of 10 galleries devoted to British decorative arts and sculpture, to be completed in winter 2020, and its $150 million replacement of the skylights in the European Paintings galleries, to be completed in 2022. But it is the Met’s Southwest Wing that has been the subject of the most curiosity, given the museum’s bumpy experiment with showing Modern and contemporary art at the Breuer (the building has been costly to run and the exhibitions have received mixed reviews); the failed effort by Mr. Hollein’s predecessor, Thomas P. Campbell, to get initial funding for the project; and Mr. Hollein’s extensive experience in contemporary art. Under Mr. Hollein, contemporary art will not be limited to the galleries, but — “in close collaboration with artists” — will temporarily occupy other unused areas of the building in surprising ways, like the Great Hall at the museum’s entrance and the eight empty niches on the building’s facade, which for a couple of months each year will be the site of a major sculpture commission. At the same time, he said, the Met will celebrate the great works in its storied collection, which in any other city would make it the major museum for Modern and contemporary art.